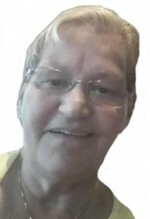 Valerie K. Barriere,70, wife of fifty years of the late Roger M. Barriere, died on Sunday, March 25, 2018 at Midstate Medical Center after a brief illness. Born in Meriden on August 25, 1947, she was the daughter of the late Frank and Mary Krystock. Mrs. Barriere was a lifelong Meriden resident and graduated from Maloney High School, Class of 1965. She was a parishioner of St. Laurent Church. Valarie loved camping in Rhode Island and was a homemaker who was devoted to her family, especially her grandchildren and great grandchildren. She is survived by her daughter, Michelle DePaola and her husband James of Meriden; a son, Roger Barriere and his wife, Jackie of Frenchville, Maine; seven grandchildren, Jeremy, James Jr., Joseph and his fiancé Esmeralda, Vanessa, Brandon, Dustin and Adian and two great-grandsons, Myles and Donovan. She is also survived by her step-sister, Brenda Siedlitz and her husband Dale, her brother Frank Krystock and his wife Kathy, three step-brothers; Chip & Sylvia Armack of Meriden, Joe Armack of Texas and Michael and Debbie Armack of Arkansas; a sister-in-law Charlotte Riss of Portland and several nieces and nephews. Valarie was predeceased by her step-mother Grace Mucci Krystock. Relatives and friends are invited to attend a funeral service on Saturday, March 31, 2018 at 10 a.m. at the John J. Ferry & Sons Funeral Home, 88 East Main Street, Meriden, CT. Burial will be in St. Laurent Cemetery. Friends and family may call at the funeral home on Friday, March 30, 2018 from 5 to 8 pm.